The fire-resistance rating is the time, in minutes or hours, that a material or assembly of materials will withstand the passage of flame and the transmission of heat when exposed to fire under specified conditions of test and performance criteria, or as determined by extension or interpretation of information derived therefrom as prescribed in the NBC. The test and acceptance criteria referred to in the NBC are contained in a standard fire test method, CAN/ULC-S101, published by ULC Standards. 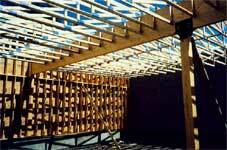 Horizontal assemblies such as floors, ceilings and roofs are tested for fire exposure from the underside only. This is because a fire in the compartment below presents the most severe threat. For this reason, the fire-resistance rating is required from the underside of the assembly only. The fire-resistance rating of the tested assembly will indicate, as part of design limitations, the restraint conditions of the test. When selecting a fire-resistance rating, it is important to ensure that the restraint conditions of the test are the same as the construction in the field. Wood-frame assemblies are normally tested with no end restraint to correspond with normal construction practice. Partitions or interior walls required to have a fire-resistance rating must be rated equally from each side, since a fire could develop on either side of the fire separation. They are normally designed symmetrically. If they are not symmetrical, the fire-resistance rating of the assembly is determined based on testing from the weakest side. For a loadbearing wall, the test requires the maximum load permitted by design standards be superimposed on the assembly. 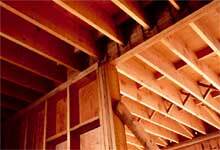 Most wood-stud wall assemblies are tested and listed as loadbearing. This allows them to be used in both loadbearing and non-loadbearing applications. Listings for loadbearing wood stud walls can be used for non-loadbearing cases since the same studs are used in both applications. Loading during the test is critical as it affects the capacity of the wall assembly to remain in place and serve its purpose in preventing fire spread. The strength loss in studs resulting from elevated temperatures or actual burning of structural elements causes deflection. This deflection affects the capacity of the protective wall membranes (gypsum board) to remain in place and contain the fire. The fire-resistance rating of loadbearing wall assemblies is typically lower than that of a similarly designed non-loadbearing assembly. Exterior walls only require rating for fire exposure from within a building. This is because fire exposure from the exterior of a building is not likely to be as severe as that from a fire in an interior room or compartment. Because this rating is required from the inside only, exterior wall assemblies do not have to be symmetrical. The NBC permits the authority having jurisdiction to accept results of fire tests performed according to other standards. Since test methods have changed little over the years, results based on earlier or more recent editions of the CAN/ULC-S101 standard are often comparable. The primary US fire-resistance standard, ASTM E119, is very similar to the CAN/ULC-S101 standard. Both use the same time-temperature curve and the same performance criteria. Fire-resistance ratings developed in accordance with ASTM E119 are usually acceptable to Canadian officials. Whether an authority having jurisdiction accepts the results of tests based on these standards depends primarily on the official’s familiarity with them. In addition, manufacturers of construction products publish results of fire-resistance tests on assemblies incorporating their proprietary products (for example, the Gypsum Association’s GA-600 Fire Resistance Design Manual). The NBC contains generic fire-resistance rating information for wood assemblies and members. This includes fire and sound resistance tables describing various wall and floor assemblies of generic building materials that assign specific fire-resistance ratings to the assemblies. Over the last two decades a number of large research projects were conducted at the National Research Council of Canada (NRC) on light-frame wall and floor assemblies, looking at both fire resistance and sound transmission. As a result, the NBC has hundreds of different wall and floor assemblies with assigned fire-resistance ratings and sound transmission ratings. These results are published in the NBC Table A-9.10.3.1.A. Fire and Sound Resistance of Walls and NBC Table A-9.10.3.1.B Fire and Sound Resistance of Floors, Ceilings and Roofs. Not all assemblies described were actually tested. The fire-resistance ratings for some assembles were extrapolated from fire tests done on similar wall assemblies. The listings are useful because they offer off-the-shelf solutions to designers. They can, however, restrict innovation because designers use assemblies which have already been tested rather than pay to have new assemblies evaluated. Listed assemblies must be used with the same materials and installation methods as those tested. glue-laminated timber beams and columns in Appendix D-2.11. The most practical alternative calculation method includes procedures for calculating the fire-resistance rating of lightweight wood-frame wall, floor and roof assemblies based on generic descriptions of materials. This component additive method (CAM) can be used when it is clear that the fire-resistance rating of an assembly depends strictly on the specification and arrangement of materials for which nationally recognized standards exist. The assemblies must conform to all requirements in NBCC, Division B, Appendix D-2.3. Wood and Steel Framed Walls, Floors and Roofs. While the information currently contained in Appendix D-2.4. addresses more historic construction techniques, there has been some resurgence in the use of such assemblies, and the information can be particularly useful when repurposing historic buildings. the insulating effects of the char layer, which protects the unburned portion on the wood. These factors result in unprotected members that can stay in place for a considerable time when exposed to fire. The NBC recognizes this characteristic and allows unprotected wood members, including floor and roof decks, that meet the minimum sizes for heavy timber construction to be used both where a 45-minute fire-resistance rating is required and in many noncombustible buildings. The calculation method in Appendix D determines a fire-resistance rating for glulam beams and columns based on exposure to fire from three or four sides. The formula for columns or beams which may be exposed on three sides applies only when the unexposed face is the smaller side of a column; no experimental data exists to verify the formula when a larger side is unexposed. If a column is recessed into a wall or a beam into a floor, the full dimensions of the structural member are used in the formula for exposure to fire on three sides. Comparisons of the calculated fire-resistance ratings with experimental results show the calculated values are very often conservative. A designer may determine the factored resistance for a beam or column by referring to CSA O86 Canadian Wood Council’s Wood Design Manual. As well, the CSA O86 standard includes an informative Annex B that provides a method to calculate fire-resistance ratings for large cross-section wood elements, such as beams and columns of glued-laminated timber, solid-sawn heavy timber and structural composite lumber. Further information on the calculation of fire resistance of heavy timber members is available in the American Wood Council’s publication Technical Report 10: Calculating the Fire Resistance of Exposed Wood Members (TR10). Sultan, M.A., Séguin, Y.P., and Leroux, P.; “IRC-IR-764: Results of Fire Resistance Tests on Full-Scale Floor Assemblies”, Institute for Research in Construction, National Research Council Canada, May 1998. Sultan, M. A., Latour, J. C., Leroux, P., Monette, R. C., Séguin, Y. P., and Henrie, J. P.; “RR-184: Results of Fire Resistance Tests on Full-Scale Floor Assemblies – Phase II”, Institute for Research in Construction, National Research Council Canada, March 2005.